There is a lot of discussion about processor power recently. A lot of the issues stem around what exactly that TDP rating means on the box, and if it relates to anything in the real world. A summary of Intel’s official declaration boils down to TDP as the sustained processor power at long periods, however almost zero motherboards follow that guideline. As a result users will usually see much higher sustained power, although with much higher performance. Some small form factor systems rely on setting these limits, so we tested a Core i9-9900K with a 95W limit to see what would happen. When a processor is initially loaded, it should enter a state where PL2 describes the maximum power for a time of Tau seconds. When in this PL2 state, the CPU follows Intel’s per-core Turbo table rules, which reduces the frequency based on the number of cores loaded. 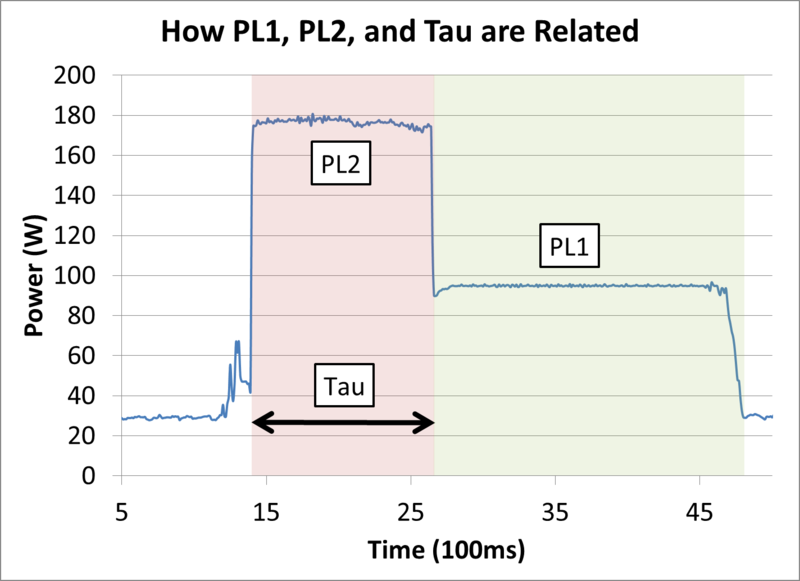 After Tau seconds, the CPU should drop down to a PL1 maximum sustained power value, which is usually identical to TDP. Depending on the CPU, this may reduce the frequency to the base frequency, or well below the all-core turbo frequency. Technically PL2 is obtained over a moving average window, Tau, such that any low power moments on the processor will 'give budget back' to the turbo mode, however the graph above is the easiest way to see the high turbo mode on a fully loaded processor. So while Intel defines a value for PL1, PL2, and Tau, almost zero consumer motherboard manufacturers actually follow it. There are many reasons why, mostly relating to overengineering the motherboards and wanting users to have the best performance at all times. The only times where these values follow any form of Intel guidance is in small form factor PCs. For example, I tested an MSI Vortex G3 small form factor desktop at an event last year. It was using a processor normally rated for 65W TDP, and in a normal desktop that processor would push over 100W because the motherboard manufacturer in that system did not put any limits on the power, allowing the power to fall within Intel’s per-core turbo values. However, in this Vortex system, because of the limited thermal capabilities, the BIOS was set to run at 65W the whole time. This made sense for this form factor, but it meant that anyone looking for benchmarks of the processor would be misled – the power profile set in the BIOS was in no-way related to how that CPU would run in a standard desktop. When a single core is loaded, the CPU is in 5.0 GHz mode as we are well under the power limit. There’s a slight decrease of 200 MHz in the 95W at two cores, but this disappears when 3-6 cores are loaded, with both setups being equal. 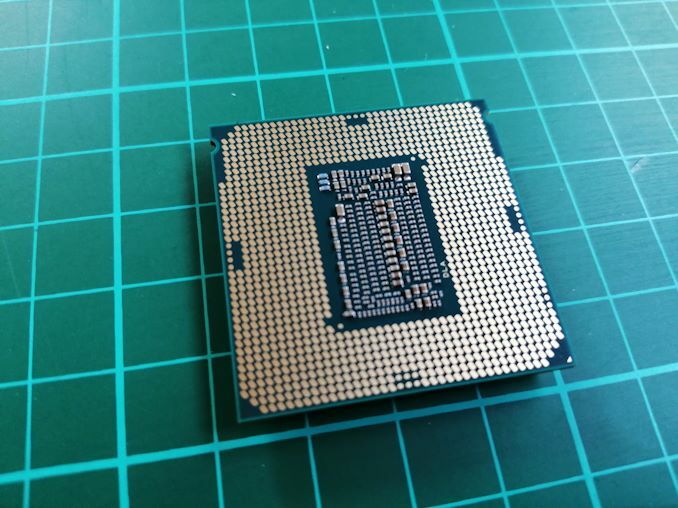 The major difference happens however when we are at 7-8 cores loaded: because of the power consumption, the Core i9-9900K in 95W mode drops down to 3.6 GHz, which happens to be its base frequency. This arguably means that we should see a correlation in most benchmarks between the two parts, but not if maximum load is ever required. 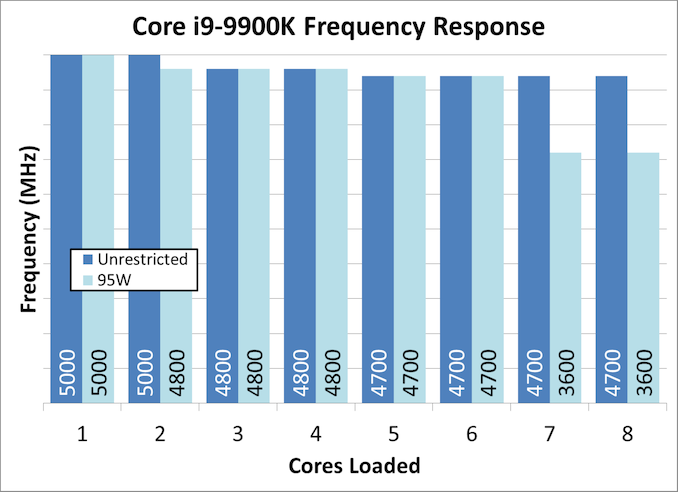 For this review, we’re putting the Core i9-9900K at a 95W power limit (as measured by the internal registers of the system) and running through our CPU test suite to see if how large the performance deficit is between the Core i9-9900K in a thermally unlimited scenario compared to a small form factor system deployment. The world of wonders. Artificial TDP, turbo modes and decreased frequency when running multiple cores. All to fool consumers and benchmark believers. It's almost a very nice graph but could really stand to have a few more CPUs labeled. I mean even the literal headlining CPU that the entire article is about isn't labeled. There's a big difference between starting to use 6-8 cores (like Civ & BF) and hitting all those cores with a heavy load for a sustained period. Show me a game benchmark that has the 9900K literally doubling the performance of a 7700K and then you'll have a game that can push the 9900K well past its 95W tdp. Game streaming from a single PC would certainly do that, but I'd hopefully streamers are doing some research and choosing hardware carefully.